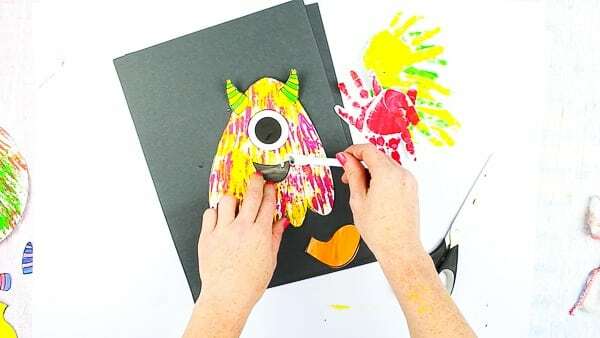 This Big Hand Paper Monster Craft is a playful and fun-filled Halloween craft for kids. These monsters can move and groove with a wave and jig. 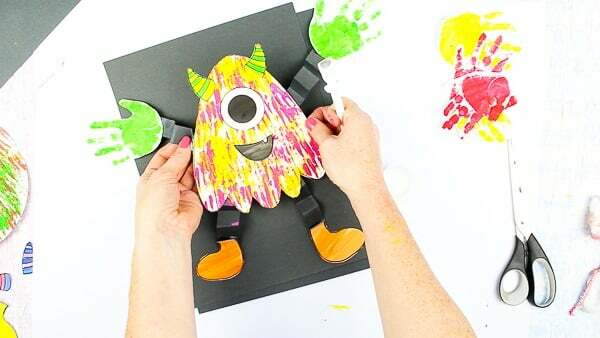 Personalised with your Arty Crafty Kids handprints, they become transformed into real little monsters ( the fun and friendly type of course! 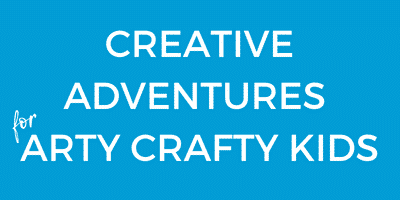 ), giving your kids the inspiration to indulge in some wonderful creative play as they craft. 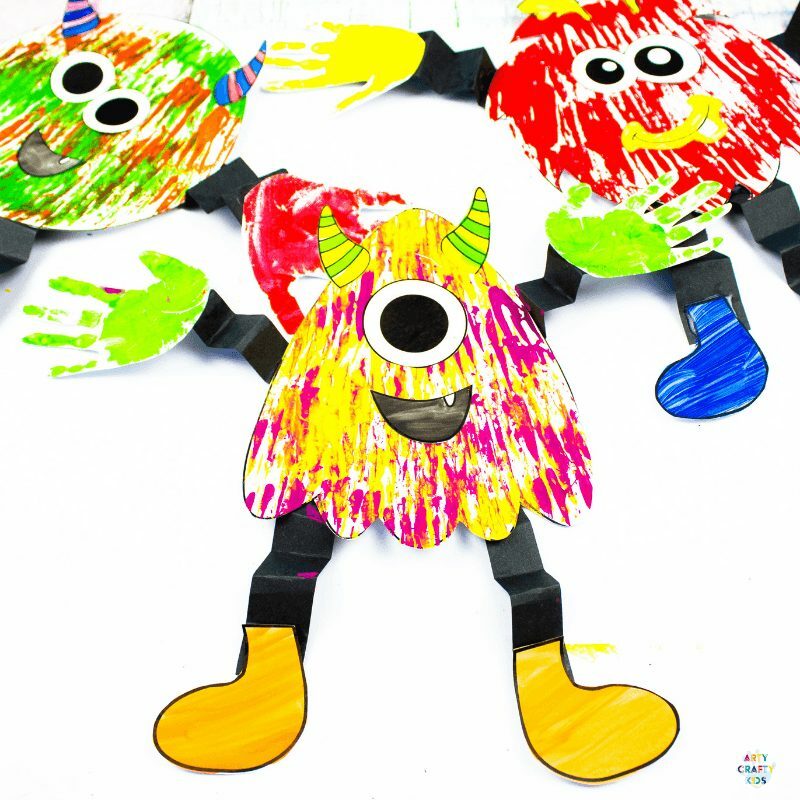 With four Big Hand Monster templates available, your Arty Crafty Kids can choose the monster that suits them best! 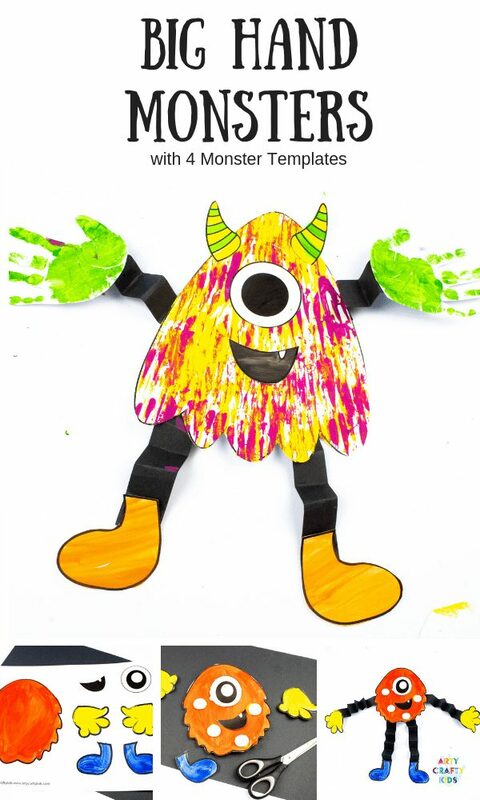 A freebie Monster Template can be found towards the end of this post by signing up to our regular newsletter! 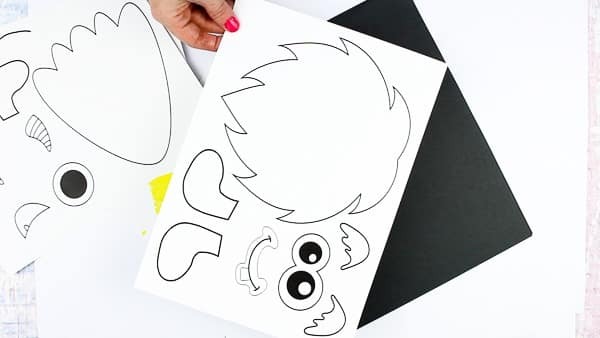 Step 1: Download and print a monster template onto white cardstock. 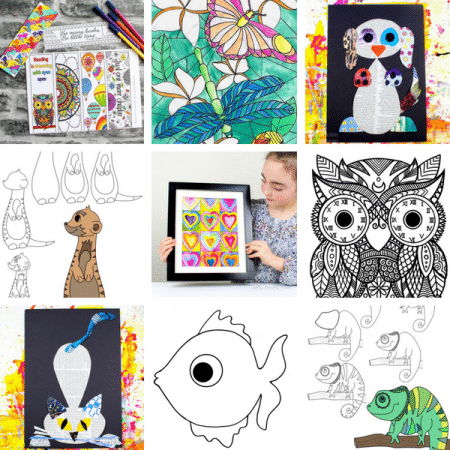 NB: A freebie Monster Template can be found towards the end of this post by signing up to our regular newsletter! 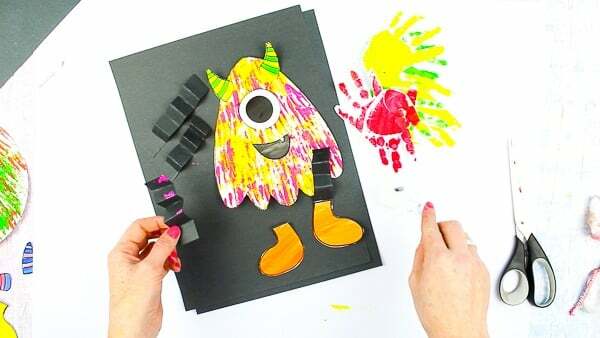 Step 2: Create some monster handprints! 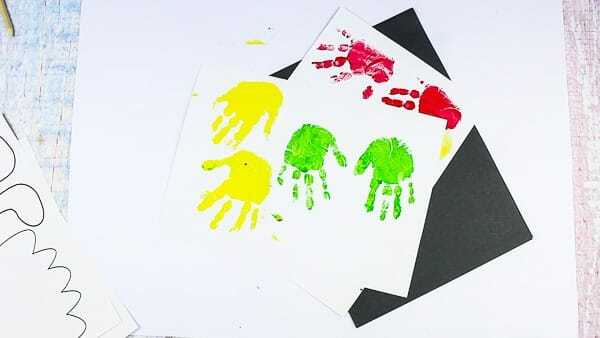 For best results, layer your Arty Crafty Kids hand with a thin layer of paint (acrylic works best for prints and colour vibrancy) using a paintbrush or sponge and then press down firmly onto a piece of good quality paper or cardstock. Using a fork, spread the paint on the palette to create a flat even layer of paint. Wipe any excess paint from the fork and place the bottom of the fork within the paint. Once the fork is covered and not so covered its filling the gaps in between, start printing! Rock the fork back and forth with each application to achieve an even print. 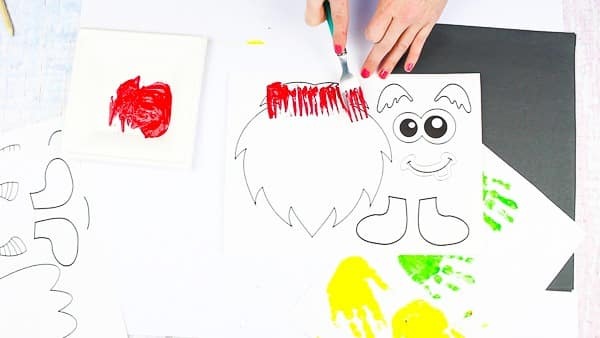 Step 4: Fill the Monster’s body with fork prints to create a cool furry effect! Paint the remaining monster elements with a paint brush. 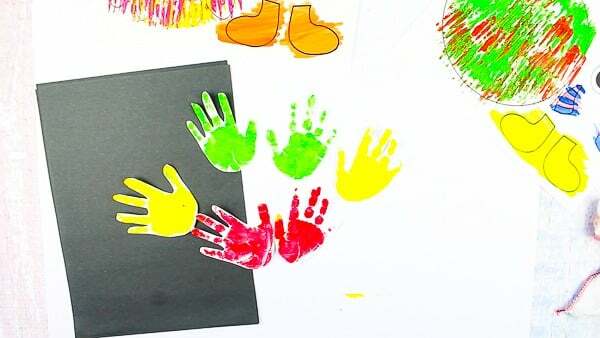 Step 5: While the template is drying, cut out the Arty Crafty Monster’s handprints. Step 6: Once the body and monster elements have thoroughly dried they’re ready to be cut out. Stick the Monster elements to the body to form a friendly monster face. Step 8: Fold the paper forwards and backwards on itself to create a zig-zag (or accordion) fold. Repeat this process with each piece of paper. 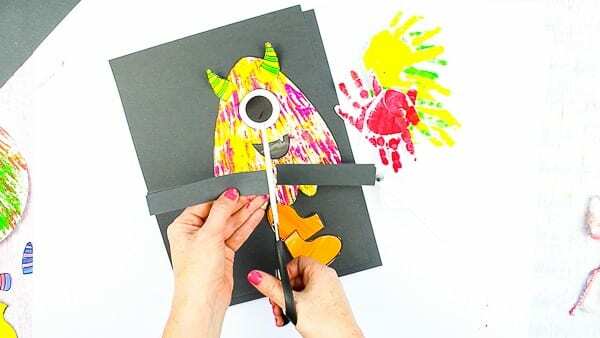 Glue two boots to the bottoms of two zig-zag papers and repeat with the handprints. Step 9: Complete the Big Hand Paper Monster Craft by glueing the zig-zag papers in appropriate places to the back of the monster body. Once dry, the zig-zag papers will give the monster movement. Make it dance and wave! 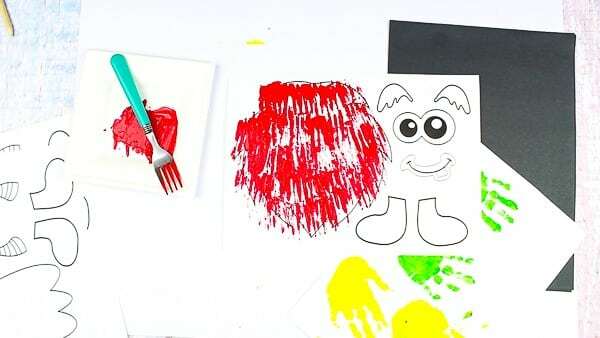 This template and many others are available in our Arty Crafty Kids Club Members Area Sign Up Here! 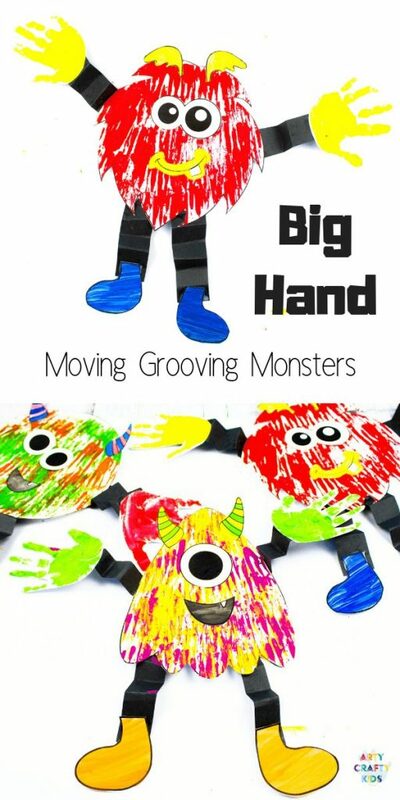 Enjoy creating Big Hand Monsters with your Arty Crafty Kids!